Young Lightgaze confides in his sister as he leaves childhood behind. Lightgaze stared through tightly focused eyes at the branch hanging above his head. He was gently touching the unyielding wood with his fingertips as he thought at it with all of his might. Beneath his back was another branch, albeit a larger one, upon which he lay in one of the large trees lining the riverbank. Despite his best efforts he could not make the wood change to his will. �Father makes it look so easy,� he muttered and again set himself to his task. Cedarwing was an old and powerful plantshaper, he knew. It was only natural, or at least Lightgaze hoped, that his children might have some measure of that talent. Thus far though he had not yet been able to tap into it. Lightgaze was four hands of summers old or so and had taken it in his head to go searching for that magic within himself. Sadly, he was having no success. As far as magic went he could send passably well with other elves. With the wolves he was a good deal better. Other than that he hadn�t come up with much that set him apart from the rest of the tribe. Had he asked them though he might have gotten a different story. Though very young still by elven standards he was a bright and inquisitive child with a somber disposition. He was very like a small adult in many ways but still reckless at times and with an annoying stubborn, independent streak. Some remarked that he would one day make a fine hunter, unless of course he managed to get himself killed first in one of his quests for discovery. What they didn�t understand, what he himself didn�t understand yet, was that he always wanted to work out for himself why things were the way they were. He was insatiably curious and had to see a thing proven to fully believe in it. Once he had his proof then he could gladly accept it. Sometimes his elf nature and his wolf side conflicted in this but he always worked it out eventually and came to some form of understanding. That is what had brought him here to the riverbank. His father had told him before that he didn�t believe that he had a plantshaper�s power but he had to prove it to himself. So intent was he on trying to prove Cedarwing wrong that he didn�t even hear the others approaching the river. One moment he was quietly staring at a branch, trying to will it to grow, and the next he heard laughter below him. It took it a moment or two to register but soon he realized that there were other elves in the water below him. Turning his head slightly he peeked down through the canopy of trees to see what was going on. Snowdrop and Shimmer had come to get some relief from the late summer heat. Peering around he saw their clothes strewn carelessly on the bank and the two maidens were splashing in the moonlight. This was nothing unusual. In fact everyone from the Holt came here to swim or bathe, especially when it was hot. For some reason though he couldn�t take his eyes away from the scene below him. There was something about the way the moonlight glinted off of Shimmer�s wet flesh and Snowdrop�s long, white hair. Turning a bit he tried to see better without alerting them to his presence. He had seen them like this before. This time though it seemed different. He felt his breath become a bit ragged as he stared and shifted himself for a better view. So intent was he on watching them that he lost track of where he was on the branch. With a sudden sick feeling Lightgaze slid right off the branch and into the water below. A few seconds later he spluttered his way to the surface and wiped the water from his eyes. Snowdrop and Shimmer merely stared in surprise at him as he continued to stare back at them. In a moment of embarrassment he realized how foolish he must look and that he had yet to speak a word. He was acutely aware of how awkward he sounded though he wasn�t entirely sure why. All he knew was that he was having trouble averting his gaze and that he was having trouble speaking plainly. Then he realized, once he managed to raise his eyes high enough, that Shimmer was grinning at him. Something in her tone sounded both tantalizing and frightening to him at the same time. He was momentarily paralyzed with indecision as she began to speak again. In the end the frightening had won out over the tantalizing. He wasn�t sure why but he suddenly felt the need to be far, far away. In a flash he was up the bank, out of the water and on his way to the wolves� den. That was where he usually went when he was confused about something and it seemed the safest place for him right now. So intent was he on making his retreat that he failed to hear the exchange that took place back at the river. Snowdrop didn�t reply to her friend�s teasing. Instead she went back to her bathing as she thought about what had just happened. If Shimmer noticed that she was being ignored it didn�t deter her in the least from keeping up her monologue. A few hours later, after a long nap in the wolves� den, Lightgaze finally stirred. He was better rested but still couldn�t get the events from last night out of his mind. In fact, he had spent the better part of his sleeping time dreaming of it. When he arose it was light out. Crawling from the den, he tested the early afternoon breeze before walking towards the Dentrees. As often as not he was up during the daylight hours anyway. His sleep normally came in several long catnaps and he, unlike most of his tribe, had no problem seeing in the bright light. In fact, he could get around just as well by the day or night, which was unusual for a wolfrider. Often he was one of the only ones up and about at this time. Occasionally some of the others had some chore or another to do, but in general only he and his sister Sunlight made a habit of being up during the day. She also could see well in the brighter light and they would talk sometimes if neither of them had pressing chores. On a hunch he again sniffed the breeze and sure enough caught his sister�s scent. She wasn�t too far away, sitting in one of the trees looking out over the Holt. It was a special tree, to him anyway. Many were the times that he had sat there with his father. Cedarwing had used his powers on it more than once to make it more comfortable for them. 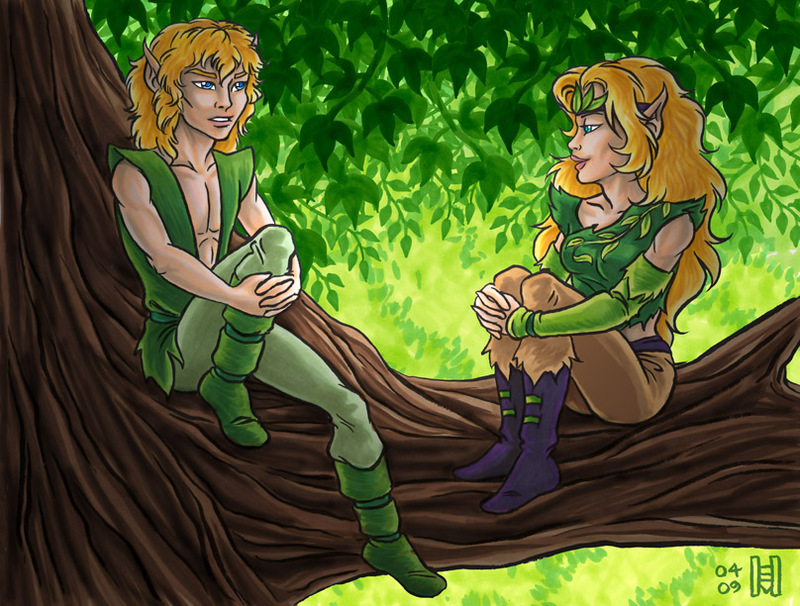 Soon he found himself at the base of the tree and a few moments later had climbed it to sit at her side. She smiled and nodded at him as he did so. When they had the opportunity they would sometimes spend the afternoon just sitting, talking and watching the day go by while their tribemates slept. �It�s a nice day,� he finally said. She nodded without speaking and smiled at him again. Lightgaze had the habit of bringing up the weather if there was something troubling him and he didn�t know what else to say. If she waited a bit and gave him some time he would usually work up to what was on his mind. After several long moments he began to speak again. Sunlight sounded convincingly concerned though she knew full well that he hadn�t been hurt. Snowdrop had seen her on the way back to the Holt and had told her everything. She had a suspicion that he had gone to sleep with the wolves and would be up skulking around during the day. Since Cedarwing, Shyheart and Lynx were away with the hunt she had decided to watch for him herself. Maybe he would be willing to confide in her and not worry to himself until their parents returned. �Tell me about it,� she gently prompted. And so he did. He told her everything, from the moment that he had been trying to plantshape the tree to when he had heard the girls and how he had been distracted and fell into the water. Even what Shimmer had said about Lynx and how he suddenly felt like he had to get away. For a long moment he considered what to say. She was taken with just how young he seemed to her just then. He had always been so mature, so like a tiny adult, that it was hard to remember how young he really was. It was true though, his scent was changing and soon he would be all grown up. Not quite yet though, but soon. He was blushing a bit but couldn�t help but grin at her joke. She knew full well how much he adored and tried to be like their older brother. As if coming of age wasn�t hard enough, to be afraid of being compared to Lynx must have been too much for him to bear. He hesitated a moment, deep in thought. �She�s not skinny,� he replied with conviction. Sunlight smiled as she regarded him. She had only been teasing but it seemed he did indeed prefer the quieter of the two girls. They were silent for a bit and merely sat together, comfortable in each other�s company. Not for the first time she wished that he had been born with an agemate as she had. Someone his own age to talk to and experiment with would have done him a lot of good. Casting her memory back she remembered how she and Moon had both become taken with how adorable they had thought Birdcatcher was and how they had conspired as they came of age together to join with him. Their plan had been successful, for what it was worth. Moon was dead and gone now, though, and Sunlight still missed her. She would always have the pleasant memories that they had made together, and for that she was thankful. Given time, she was sure her brother would make similar memories of his own. As the afternoon wore on into evening they talked some more and gradually drifted to other subjects. Lightgaze was indeed building his own memories. Not just the tantalizing image of the girls in the pool but of these pleasant times with his sister. Many challenges would face him in the future but for now he didn�t dwell on that. It was enough to be here and at peace. The rest would come in it�s own time, he realized.